The economic crisis that began in the summer of 2008 with the collapse of Lehman Brothers reverberated all around the world. Arguably its most dramatic effects were to be found in Europe: the collapse of revered financial institutions, the bailouts of high-street banks and a collapse in share values plunged many European economies into recession and led to a sovereign debt crisis which threatened Greece with expulsion from the Euro and even the survival of the Euro itself. The impact of the recession on European citizens has been inescapable: rising unemployment, public-sector pay freezes (and in some countries reductions), pensions under threat, welfare spending restricted, to mention just a few of the consequences and austerity measures enacted by governments. We might sum up these factors in a single word: insecurity. Empirically all of those who are involved in Christian mission know that in times of crisis people are more open to God. As the saying goes “there are no atheists in the trenches”. However, sociologists are only now beginning to discover just how strong a link there is between religion and insecurity. Since the 19th Century sociologists of religion have argued that religious belief and practice would decline as modernization provided a more rational and scientific explanation of life, and replaced the social functions of religion with secular alternatives. This process of secularization was considered until recently to be an irrefutable fact. Yet over the last thirty years the secularization thesis has come under attack from many quarters, not least because it flies in the face of facts: an increasing majority of the world population holds a religious worldview, and there are many countries where modernization has not led inevitably to religious decline. Europe, however, has proved to be in Grace Davie’s words, an exceptional case of secularity. At the turn of the century, the American political scientists Pippa Norris and Ron Inglehart put forward a new theory to explain religious variations worldwide. Their book, Sacred and Secular: religion and politics worldwide, made use of the data from the World Values Survey/European Values Survey, and suggested that higher levels of religiosity in certain societies can be explained by higher levels of insecurity. 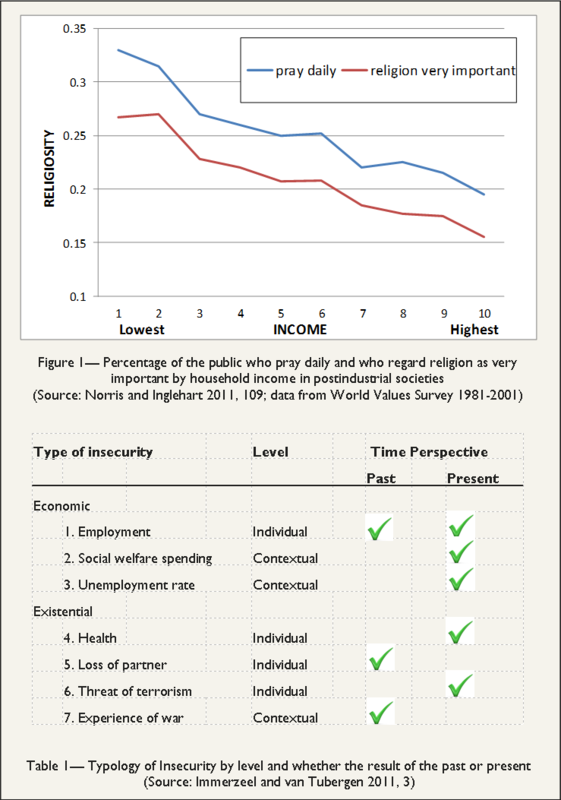 In particular they found that two core conditions of economic insecurity (lower levels of human development and higher levels of socio-economic inequality) were positively associated with religiosity (Figure 1). Further research on the role of contextual economic insecurities (e.g. income inequality) has generally supported Norris and Inglehart’s findings. But until recently no detailed study had been made of individual economic insecurities, such as unemployment, nor of existential insecurities such as the threat of terrorism or the loss of a partner. In a 2011 paper, Immerzeel and van Tubergen, used data from the four rounds of the European Social Survey (2002-2008) to test the theory. They began by making a distinction between two dimensions of security: economic and existential. 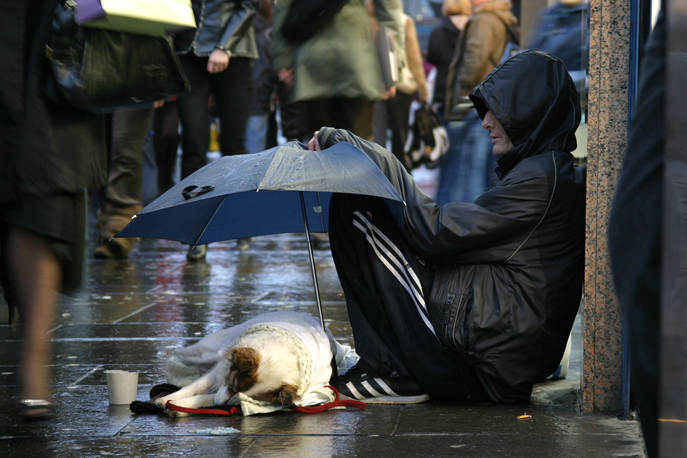 Economic insecurity refers to a person’s economic experience (level of income, unemployment, etc.) whereas existential insecurity is concerned with the experience of life-changing or life-threatening situations (death of a partner, threat of terrorism, etc.). They also establish a distinction between past and present insecurities, and between individual and contextual factors. Table 1 shows the types of insecurity, the level and whether past, present or both time perspectives figured in their analysis. Immerzeel and van Tubergen found that both economic and existential insecurities play a role in religiosity and these effects were observed in both private and public dimensions. Current employment. The data clearly shows that the better a person’s current economic position, the less religious they are: “employed people with an unlimited (permanent) contract are significantly less religious than people who have a temporary contract, who are unemployed, who are a student, or who are inactive” (p6). Across the 26 countries weekly attendance by temporary employees is 15% higher than permanent ones, for unemployed 31% higher, and students 81% higher. Past employment. The worse one’s experience of employment as a child the more religious one is in the present. This is true both for unemployed fathers and mothers. However, personal experience of unemployment seems to have the opposite effect, leader to lower levels of subjective religiosity and church attendance. Welfare spending. There appears to be no significant relationship between welfare spending and subjective religiosity but this may reflect the small relative difference between the European countries in the sample and may be significant when compared with other countries with no welfare provision. Unemployment rate. Immerzeel and van Tubergen found evidence of a relationship between unemployment rate and weekly attendance, but not for subjective religiosity. Health. People who perceive their health as good have lower subjective religiosity scores than those with bad health. In the case of attendance the opposite trend is observed: people who perceive themselves as more healthy are 25% more likely to attend church weekly than those who see their health as poor. They suggest that while people with bad health may be more religious they are less able to attend religious meetings than those who are healthy. Loss of partner. People who lost their partner (the widowed) are more religious than those who have never lost a partner. In fact the widowed are significantly more religious in both subjective religiosity and church attendance than the married, cohabiting, separated, divorced or single. War. Once again there is a clear positive association of the experience of war with religiosity: those how have experienced a war perceive themselves as more religious and have an 18% higher odds of attending church weekly compared to those who have never experienced armed conflict. Terrorism. There is some indication that the more one believes that a terrorist attack is likely, the more religious one is. Overall the results suggest that economic insecurity is more important for explaining religiosity than existential insecurity. Past and present insecurities and individual and contextual factors were found to influence religiosity in roughly equal measure. It is clear that there may be many different reasons for people to feel insecure but whatever the reason, the statistics suggest that insecurity is often correlated with religiosity, even in Europe. In particular, it appears that economic insecurity is associated with increasing religiosity. The current economic crisis may prove to be a golden opportunity for the churches of Europe, perhaps a unique one for the current generation of Europeans, to demonstrate the hope that Christ offers to all who will come to him. I use the word demonstrate deliberately, since proclamation will not be sufficient. Economic insecurities will need to be met with more than words. Many churches are engaged in action against poverty, in debt counselling, in employment creation and some of these initiatives are featured in this edition of Vista. Yet surely we can and must do more. As we have observed in previous editions of Vista, secularization may have reached its limit and religious attitudes and values are showing some signs of a rebound. Churches and mission agencies must seize the day and despite our own economic insecurities, demonstrate our faith in the “trenches” of 21st Century Europe. European Mission in Crisis is not a headline declaring our weakness but rather a declaration of our calling, to take the message of Christ in word and deed into the crises of Europe, in heartfelt confidence that Christ is still the hope for today’s Europeans. For some years now Europe has been mired in economic crisis and its consequences have been devastating. In some countries, revered financial institutions have come to ruin. In others, unemployment has risen to unprecedented levels. And in some countries, the strain on the welfare state has led to a sovereign debt crisis which has brought into question the future of the Euro. The latest issue of Vista considers the current crisis as a context for Christian mission. What challenges and opportunities are there for churches and mission agencies engaging in mission in a Europe in crisis?